Thought for the Day...: Click to View or Add Text. We will show you how we built a remote cabin and give you suggestions on how to live self sufficiently. We have chosen the Ozark Mountains in Missouri for our cabin, however the concepts used here can be implemented almost anywhere. The Ozark Mountains are the oldest mountain range in the world. The range is 400 miles long and 300 miles wide and includes the northern half of Arkansas, the southern two-thirds of Missouri, the eastern third of Oklahoma, and small portions of Illinois and Kansas. This geographical area made up of rolling hills, swiftly flowing streams and rugged forests. Life takes on a slower pace in the Ozark Mountains. With scenes of pioneer cabins among the hardwood cover. 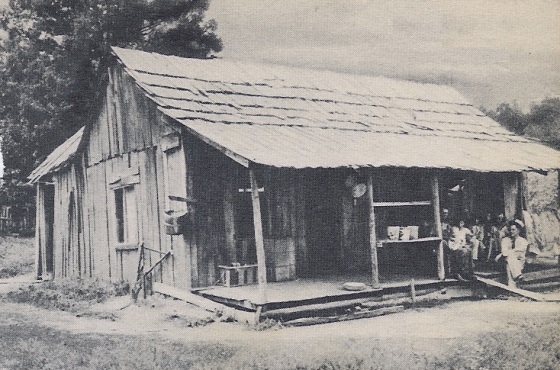 Sparsely populated, the Ozark region is unknown to many people. It is indeed a place where you can get glimpses of an earlier way of life, but it also holds many beautiful, scenic discoveries within its landscape. 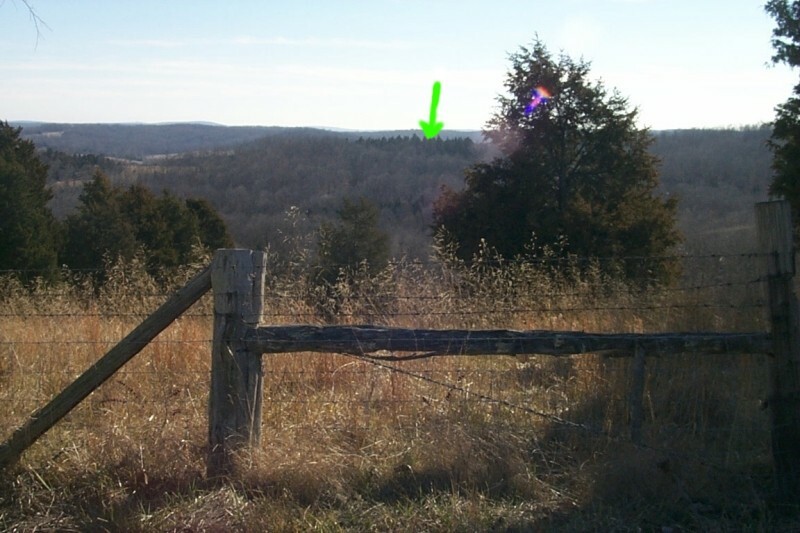 In Feb. 2000 we purchased 40 acres of remote Ozark forest to use as a place to get away. The Ozarks are a wonderful place to build a weekend retreat. We started by clearing a road up to the site we selected for our cabin. To get started I will show a picture of the land we built our cabin on. These are rolling foothills that are covered with hardwoods and cedars. The green arrow is pointing to the actual location of our cabin.